What do the hand signals used by umpires mean and when are they used? 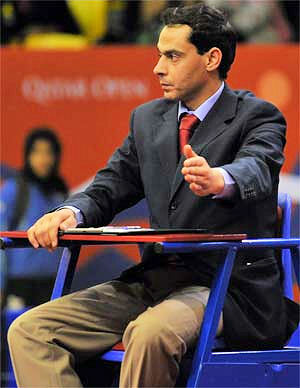 In 1981 the International Table Tennis Federation (ITTF) introduced hand signals for use by international umpires. 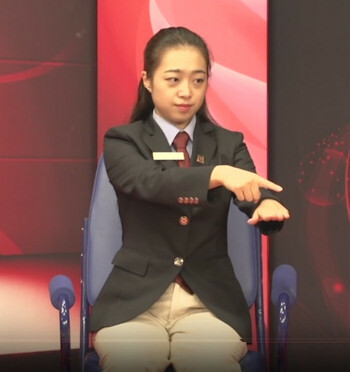 So, in addition to controlling the match with verbal communication, umpires can also use approved hand signals to indicate certain decisions. This is especially useful where the noise level makes it difficult for the umpire to be heard. Umpires are instructed that these hand signals should be clear and positive but not unnecessarily flamboyant or aggressive. Umpires must also ensure that hand signals are clearly separated. For example, they should not indicate a point scored with one arm and simultaneously indicate the next server with the other arm. 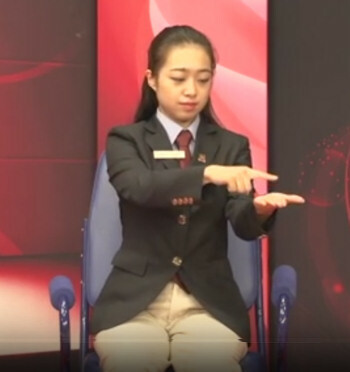 However, we need to be aware that the use of hand signals is included in the Regulations for International Competitions rather than the Laws (rules) of table tennis. So the Regulations may or may not always apply. As a general rule, the higher the level of competition, the more likely it is that some or all of the Regulations will be used in addition to the basic Laws. The score 0 may be expressed as either "zero" or "love". In a team match the name of the Association may be used instead of, or as well as, the player's name - for example "Smith of England to serve" or "England to serve". 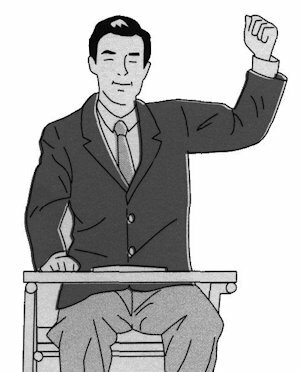 This hand signal is also used when a change of server is due. The umpire should point to the next server with an open hand. This may be followed by the name of the next server, but this should be decided before the event starts so that all umpires at an event act consistently. 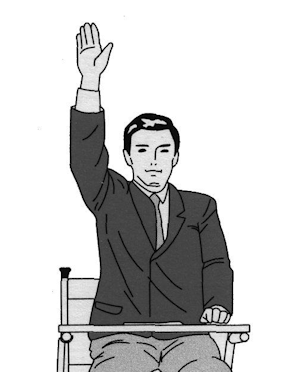 When the umpire declares a let, he or she should raise one hand above their head. 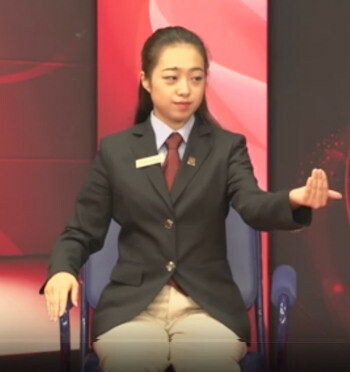 If there is an assistant umpire, he or she should also use the same hand signal to attract the umpire's attention when making a decision within his or her jurisdiction. The umpire should then repeat the score to show that no point has been scored. You can read more about lets here. 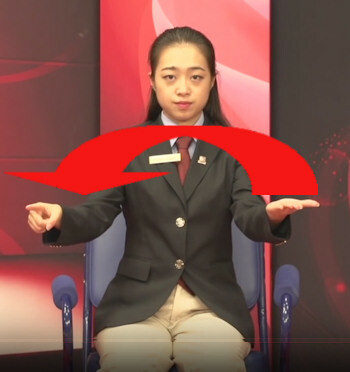 When a point has been won, the umpire should raise their arm on the side nearest to the player or pair who won it, so that their upper arm is horizontal and their forearm is vertical, with the closed hand upward. The umpire should then call first the number of points scored by the player or pair due to serve next, then the number of points scored by the opposing player or pair. The umpire should normally call the score as soon as the rally has been decided and not wait until he or she judges that the players are ready to resume play. However, if there is loud applause or a player is retrieving the ball from the back of the playing area, the umpire may prefer to delay his or her call slightly until satisfied that the players will be able to hear it. 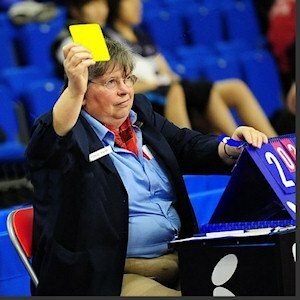 In 1991 the ITTF introduced yellow and red cards for misbehaviour and/or when the rules are broken. You can read all about yellow and red cards here. 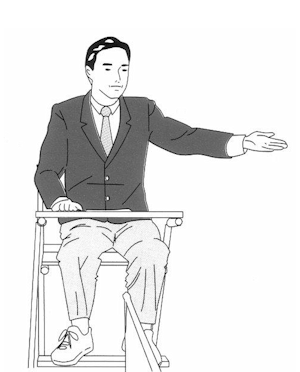 When issuing a yellow or red card, the umpire should raise their arm above head height and hold up a yellow or red card towards the offender, without leaving their chair. And in 1999 the ITTF introduced time-outs/white cards. The umpire should use the same hand signal, i.e. raising their arm above head height - but with a white card. You can read all about time-outs here. 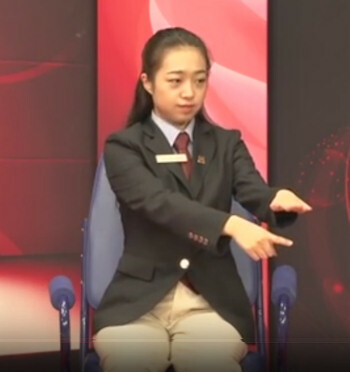 In 2014 the ITTF proposed several new hand signals and a consultation process began. These were all designed to indicate the umpire's decision in respect of illegal services. You can read all about the service rules here. 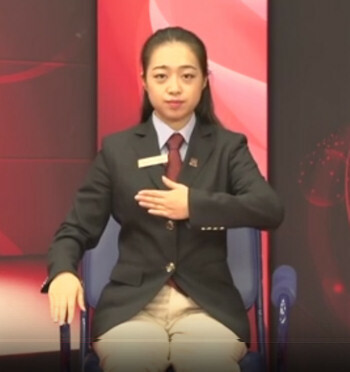 Unfortunately it was impossible to have a single hand signal for all the different kinds of illegal service actions, so it was necessary to develop several hand signals. Here are the various hand signals used to indicate which part of the service rule has been breached. If the player requires further explanation, the umpire may also use the words shown. These new hand signals for illegal services were implemented from Friday 1st July 2016. Ball not resting on palm. In addition to this hand signal, the umpire can say ... "ball resting on the fingers"
Palm not open and flat. In addition to this hand signal, the umpire can say ... "palm not opened"
Ball not above the level of the playing surface. In addition to this hand signal, the umpire can say ... "below the playing surface"
Ball not behind the server's end line. In addition to this hand signal, the umpire can say ... "inside the end line"
Ball not thrown up at least 16cm (approx 6 inches). In addition to this hand signal, the umpire can say ... "not high enough"
Ball not projected near vertically upwards. The finger will indicate an arc shape. In addition to this hand signal, the umpire can say ... "not vertically"
Ball hidden from the receiver. 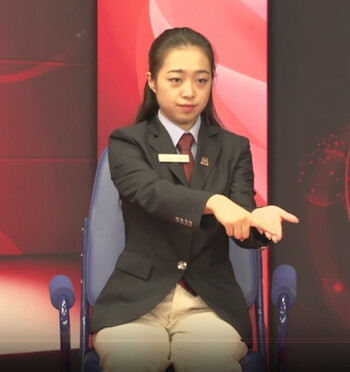 In addition to this hand signal, the umpire can say ... "hidden by (elbow / shoulder / head / partner)"
Details about the duties of table tennis referees and umpires can be found here. 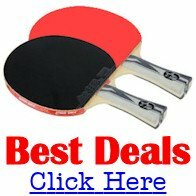 Details about who are the table tennis officials can be found here.